The old place got a remodel that perfectly suits its new owner — old houseboat into a “floating urban cabin” using materials contemporary and reclaimed. IT’S A DAY for ducks for sure. The sky is a wet flannel blanket. The rain falls down and sprays sideways in irritable gusts. But that’s just outside. 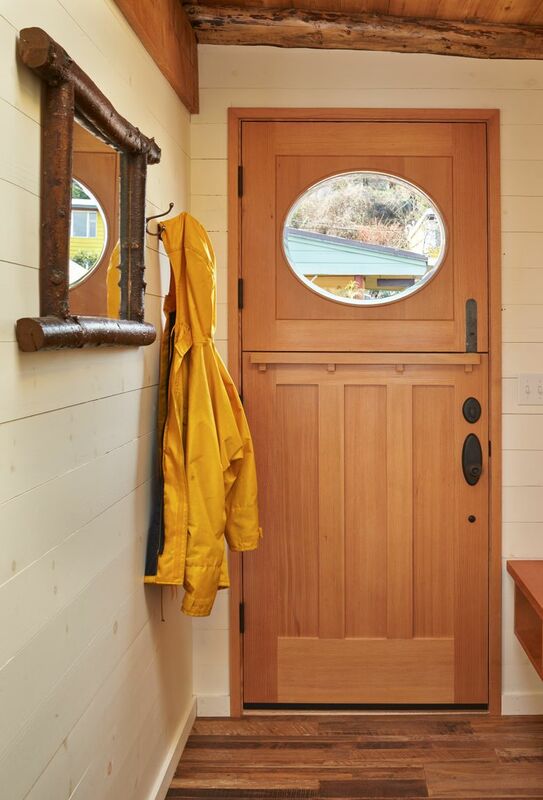 Inside, seated at the dining room table of this charming floating cabin at the end of a dock, it’s downright bright, cheerful and toasty warm. Maybe. 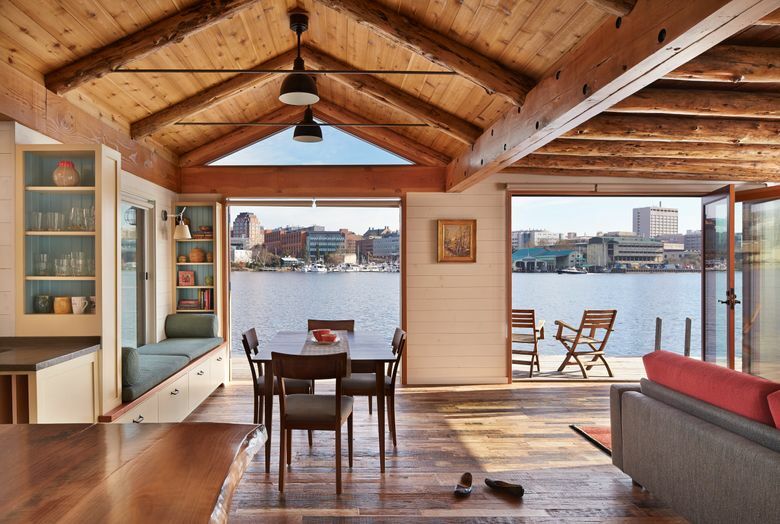 Or maybe it’s the perfect remodel that perfectly suits its new owner — old houseboat into a “floating urban cabin” using materials both contemporary and reclaimed by contractor Sten Karlstrom and project manager Andy Houston of Karlstrom Associates, and designer Theresa Freeman of SHKS Architects. 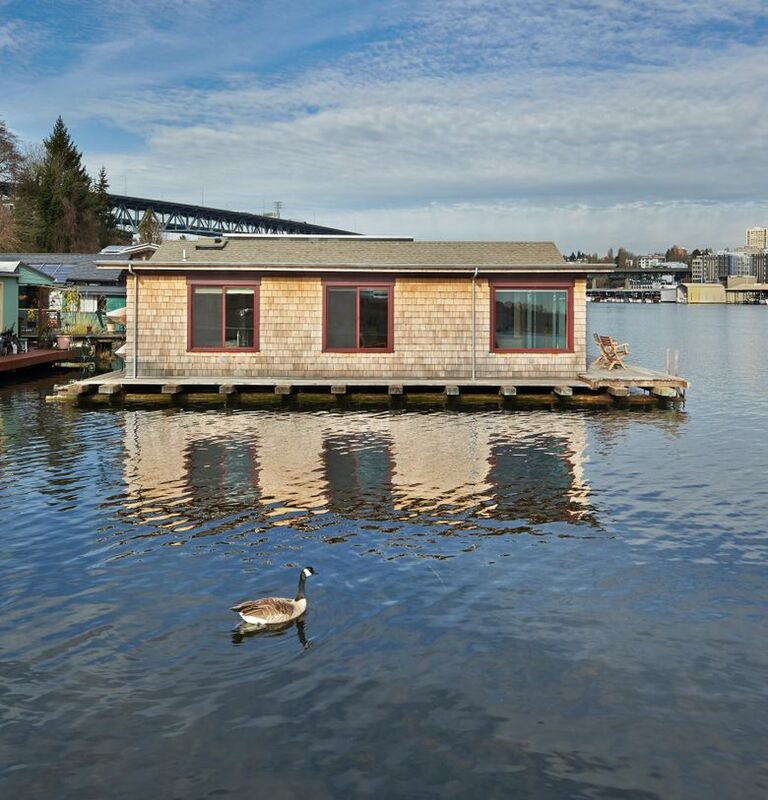 When Milly found the little place at the end of the dock (700 square feet), the houseboat was uninhabitable. Milly saw a blank slate. Possibility. The rest of it was left to evolution: After rebuilding its floating platform, Milly spent a year pondering her little house’s path. It very much is and does. 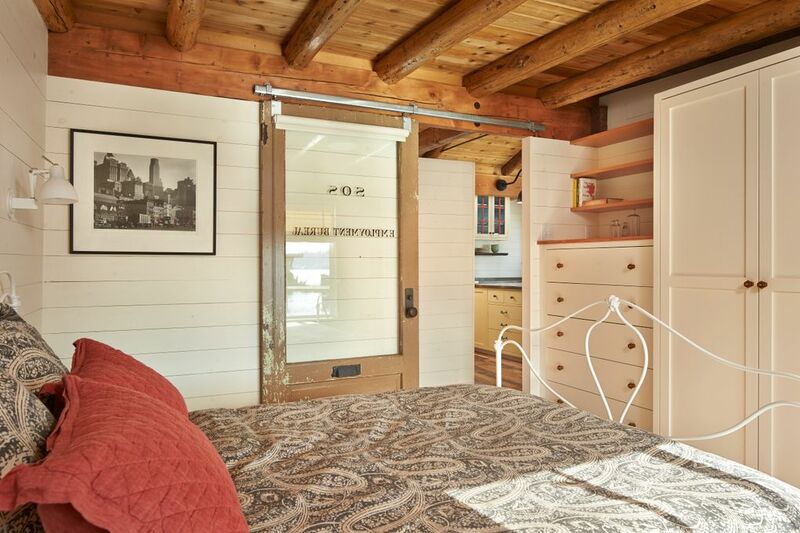 Original plans called for the cabin to have a new second story. Milly declined. 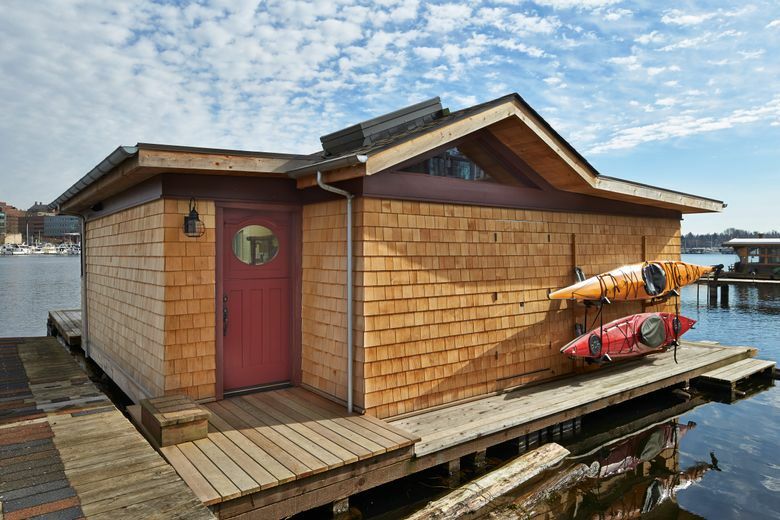 The only thing distinguishing her home from those of her floating neighbors is its coat of yet-to-weather yellow Alaskan cedar shakes. 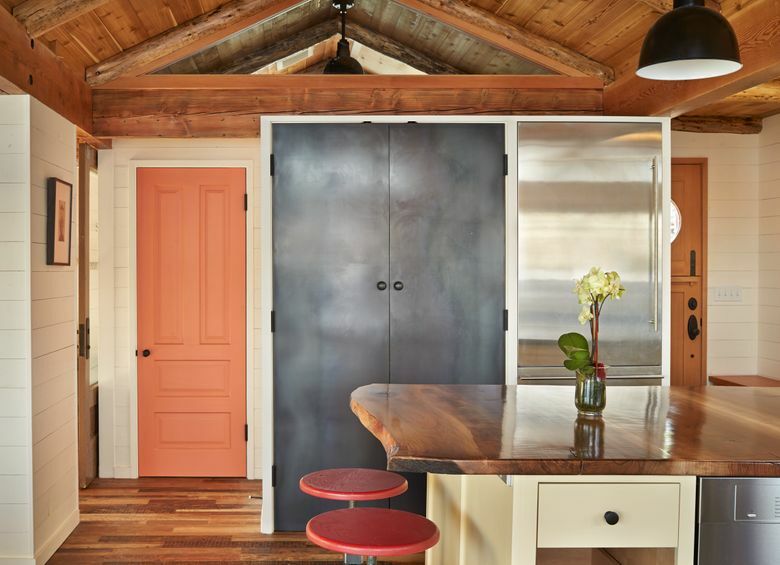 Once past the Dutch door, it’s floor-to-ceiling glass to the lake among a curated stew of modern/cabin: Walls are paneled in horizontal pine planks painted in a creamy white called Mayonnaise (Benjamin Moore). The floor is rough and reclaimed teak, and imparts an industrial/indestructible feel (some boards are charred). Overhead are lodge-worthy and handcrafted Alaskan yellow cedar peeled beams, peaked over the dining room/kitchen, flat and lower for a more intimate feeling in the living room and bedroom. The main living space is open, and feels large. There is plenty of room for the sofa and full-sized dining table with leaves. The kitchen, meanwhile, has both a country feel and size. 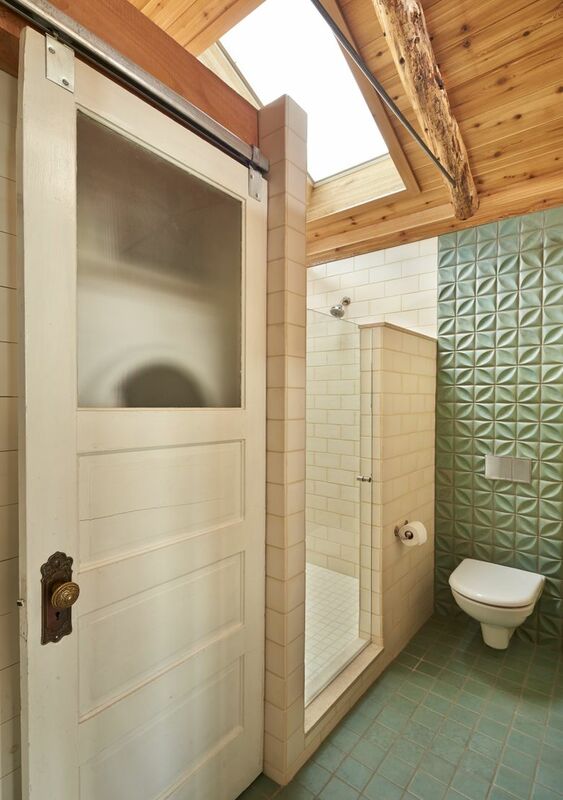 There’s a large porcelain farm sink, lots of butter-yellow cabinets (even racks for trays and platters). Open shelves are backed by beadboard in robin’s-egg blue. The counter is Milestone, stained deep olive. A closet there is blackened steel. 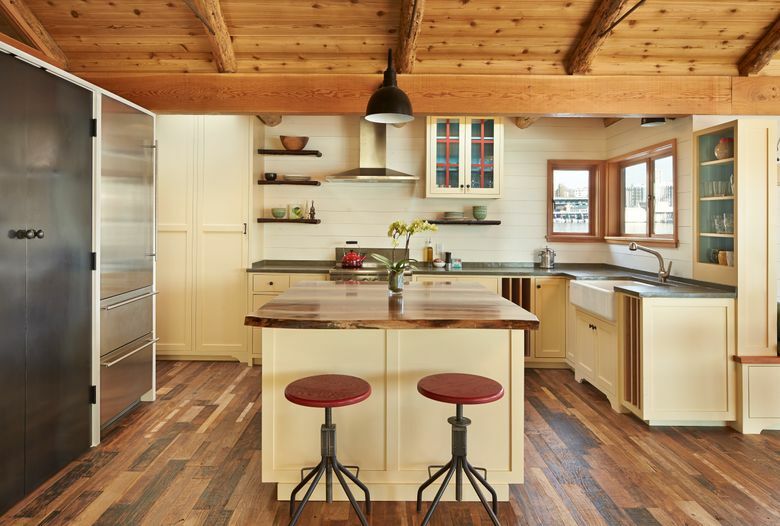 And, best of all, there’s a large island topped by live-edged walnut planks. “It’s wonderful,” Milly says of the rustic-modern-country result. With the kids grown it’s a place of her own.